Megan shared her very first bump pic on Instagram a few days ago and things seem to be coming along very nicely, thank you very much! Megan and her other half, AFL player Shaun Hampson are already parents to a little boy, 2-year-old River. After a series of challenges over the last few years, including a miscarriage, the pair are obviously over the moon about their impending new arrival. However, between announcing “bun in the oven” was on the go, and the cradling-bump-shot above, Gale hit a different kind of bump – an ankle injury that left her impressively battered and bruised.. The usually sure-footed model-mum says this mis-step is pretty typical of her current pregnancy situation. “When I’m pregnant, I am the world’s most uncoordinated human,” she admitted. We can 1000 percent relate. Gale then went on to describe the seemingly benign series of events that left her on the couch, strapped up with ankle elevated. “I was going to walk up our stairs and my foot was just placed badly on the step and I rolled over and heard this crunch and this tear and went down like that,’ she said as she clicked her fingers. That ominous crunch and tear hurt. It hurt a heck of a lot. “To say it was agonizing is putting it mildly, but of course my main immediate and major concern was the baby and if it was okay. So the good news is that bubs is fine and that has been an absolute load off because the thought of something happening to this little baby was obviously quite distressing as I’m sure you can imagine,” Gale explained. 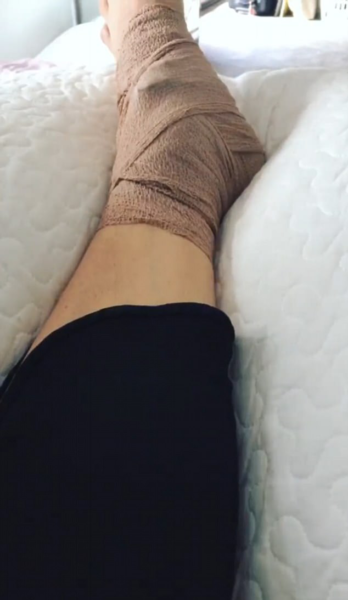 At time of writing, she hadn’t revealed whether her ankle is broken or just a badly-bruised sprain or “roll”. She’s on advice to stay home and rest – although she posted her gym shot the next day, so perhaps she was given the all clear and hasn’t shared that with us just yet. We wish her a speedy recovery, more time on the couch eating biscuits and less time at the gym!